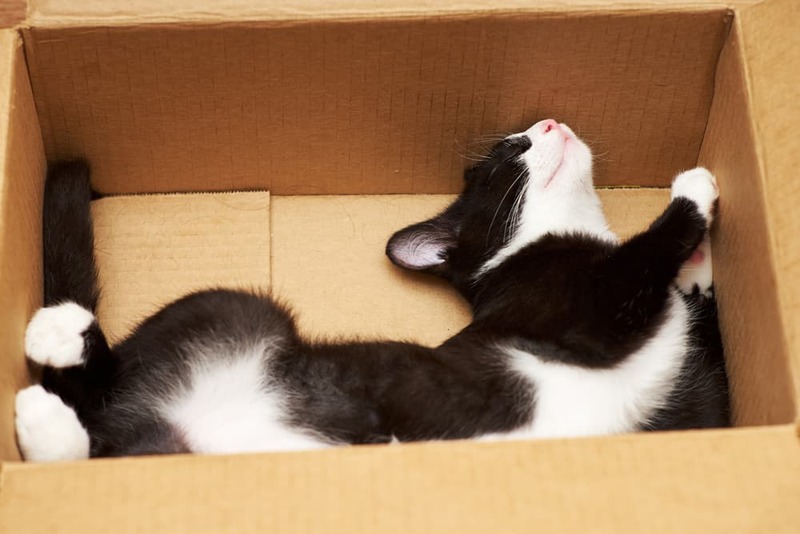 →Why Do Cats Like Boxes? Following my last post about Cats and Boxes, here is a little explanation to the phenomenon. Just bought yourself a nice new pair of sneakers? Great – a nice new treat for your feet and the shoe box will make your beloved kitty purr with delight. What is it with cats and boxes? Why do they feel the need to climb into any box-like container that becomes readily available, and claim it as their own? We all know that cats can be sensitive creatures, they love people one minute and loathe them the next. Enjoying company is at their discretion and they can take you or leave you depending on their mood! So, it stands to reason that if they are feeling anti-social your cat will seek out a space that gets him away from all annoyingly needy humans. Let’s state the obvious (in case there’s anyone reading this who knows absolutely zilch about our furry friends) – cats like to nap. They like to snooze (a lot) and can spend up to 20 hours each day dozing. Lazy fluff-balls! No wonder people have the impression cats are a little bit cosseted! When cats are seeking a place to rest their furry head they look for somewhere protected and sheltered. If he were out in the wild your feline friend would have to be mindful of predators and even though your home contains nothing more ferocious than a hairy spider (and let’s face it Tiddles would pounce on that and tear off a leg or two before you can say “here kitty, kitty)! Your cat still has the innate urge to find somewhere that looks and feels safe. So, he chooses to sit and snooze in a box! Makes perfect sense really! Our feline friends may be attracted to compact, enclosed spaces because they are drawn to quiet and calm. Climbing inside a box makes your cat feel secure, no prying eyes staring at him or wandering hands trying to caress his fur – go stroke someone else buddy! Too much bother and noise can lead to a stressed cat and that will send your miffed moggy off to seek tranquillity in the confines of a cozy space – just like a small box. 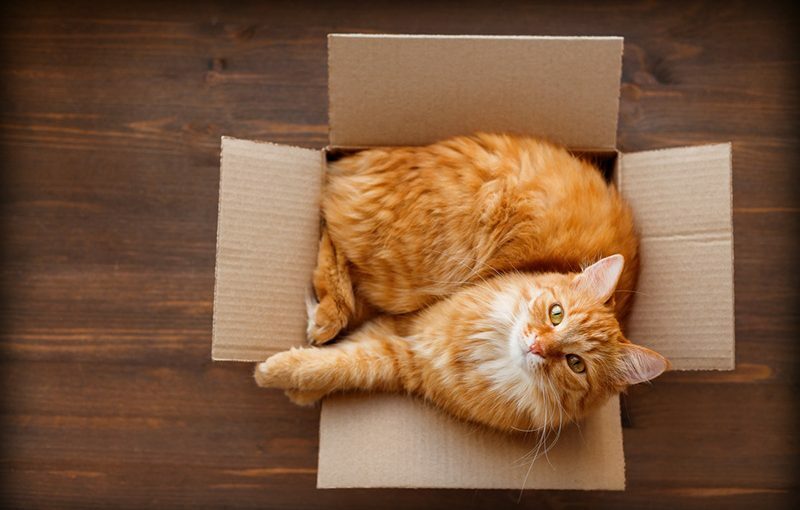 It sounds a little deep to imply that cats use boxes as a security blanket or a “coping mechanism” but that’s exactly what they do – seek a place that they can feel comfortable. An irritable cat is not a pretty picture, never try and pull your moggy involuntary from their box, unless you fancy a few claw marks for your trouble! 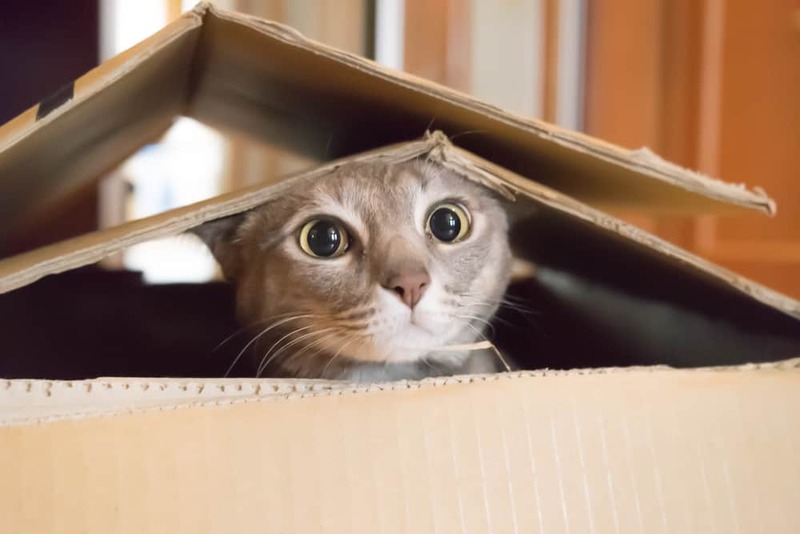 Cats also love boxes because they provide a perfect opportunity to indulge in one of their favorite past-times – hide and seek. Or actually the game is better described as just “hide.” Let’s face it, your cat is not remotely bothered about you seeking or finding him – so don’t bother! It’s a game for one and your cat is more than happy to play alone! There may be one or two exceptions – cats that prefer sleeping on your lap or sitting up high on a windowsill, but in the main boxes seem to hold a strange allure for cats – and they just can’t resist. So, if you need an excuse to buy a new pair of shoes go for it, after all your cat can never have too many boxes!